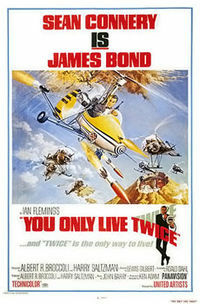 You Only Live Twice (1967) is the fifth spy film in the James Bond series, and the fifth to star Sean Connery as the fictional MI6 agent James Bond. The film’s screenplay was written by Roald Dahl, and based on Ian Fleming’s 1964 novel of the same name. It is the first James Bond film to discard most of Fleming’s plot, using only a few characters and locations from the book as the background for an entirely new story. In the film, Bond is dispatched to Japan after American and Soviet manned spacecraft disappear mysteriously in orbit. With each nation blaming the other amidst the Cold War, Bond travels secretly to a remote Japanese island in order to find the perpetrators and comes face to face with Ernst Stavro Blofeld, the head of SPECTRE. The film reveals the appearance of Blofeld who was previously a partially unseen character. SPECTRE is both working on behalf of and extorting the government of an unnamed Asian power, implied to be Red China, in order to provoke war between the superpowers, China being at odds with both sides at the time: see Sino-Soviet split. During the Japanese location filming Sean Connery announced that he was resigning from the role of Bond; however, Connery did later return in Diamonds Are Forever and the non EON Bond film Never Say Never Again. You Only Live Twice is the first Bond film to be directed by Lewis Gilbert, who later directed 1977’s The Spy Who Loved Me and 1979’s Moonraker, both starring Roger Moore. These three Bond films are notable for being epic in scale. The first Bond film to be released in the northern hemisphere summertime, the film was a great success, with positive reviews and over $111M in worldwide box office, and has been parodied most prominently by the Austin Powers series and its scar-faced, Nehru suit-wearing Dr. Evil. The backing soundtrack to the film, originally performed by Nancy Sinatra, was used by British singer Robbie Williams in his hit “Millennium”.